Her favourite foods are Portuguese Shepherd’s Pie with loads of creamy mashed potato on top, a roast lamb dinner with the lamb roasted in butter and, her biggest downfall, Haagen Dazs ice cream. At her biggest, Catia was a size 18 but managed to shed 3½ stone. Then, in 2009 she had knee surgery and has gone back to a size 16 now and, at 5’7” Catia weighs in at a cuddly 13 stone. Catia said her cooking was definitely indulgent and slightly wicked. She said Portuguese cooking involved a lot of olive oil, butter and cream so a lot of the dishes were very high in fat but also very luxurious and always reminded Catia of home. It was time for Gizzi to investigate Catia’s fridge, freezer and cupboard. There was lots of sugary, chocolaty breakfast cereals. Gizzi suggested that maybe Catia could start the day with some toast and a poached egg which would fill her up for longer instead of filling up with sugar. Catia certainly seemed to have a very sweet tooth with her cake mixes and the tubs of Haagen Dazs! But it is Catia’s indulgent Cookie and Cream Haagen Dazs that Gizzi needs to re-invent first. Gizzi told Catia that she was going to show her how to make some proper ice-cream and went on to explain that ice cream is fatty for various reasons but mainly because of the cream that is used to make it. It also has a lot of eggs in it because it is made using a custard base. Gizzi told Catia she had got a bit of a cheat to help make the ice cream lower in fat and calories. Catia was VERY keen on that! Gizzi’s cheat was . . . custard powder! Lower in calories and fat than the eggs that would normally be used. Instead of using cream, Gizzi used some half fat crème fraiche which would give the ice cream the luxurious texture associated with it. Oooh, here we go with the tips! And to give it some extra body, Gizzi used some zero fat Greek yoghurt. Catia’s favourite ice cream is cookies and cream so, because Gizzi wanted her lower calorie, lower fat version to be as close to Catia’s favourite as possible, she used Amaretti biscuits to give it the crunch. Catia’s Cookie and Cream Haagen Dazs ice cream comes in at a whopping 281 calories! 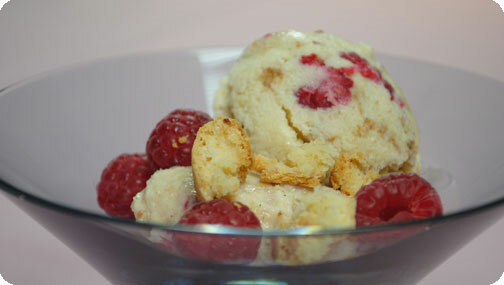 Gizzi’s Amaretti and Raspberry ice cream comes in at a very respectable 167 calories. Not bad for a sweet, indulgent treat! Working out at home doesn’t need expensive equipment and you don’t need to leave the comfort of your living room. For Catia, she could do bicep curls with a bean can in each hand which will help to tone up the bingo wings. Catia is not able to do exercise that involves pressure on her knees so, she could use resistance tubes to tone up her upper body and sit ups to tone and reduce a muffin top! She could also do press ups against the wall. If she did all of this for 10 minutes every day, she could burn off 700 calories a week without leaving the house! Gizzi had decided to try Catia with a Roast Rack of Lamb with a Warm Courgette, Bean and Flageolet Salad instead of Catia’s normal Roast Leg of Lamb with extra trimmings. Gizzi told Catia that not only would the dish be a lot less calories but, it would cook in under 20 minutes! When Gizzi was preparing the courgettes, she showed Catia an Oil Pump. It means you can use oil to cook with but you use a fraction of the normal amount because it sprays a light dusting in a controlled way. Great tip! Catia’s Roast Leg of Lamb Dinner with Extra Trimmings contains a huge 1446 calories per portion! 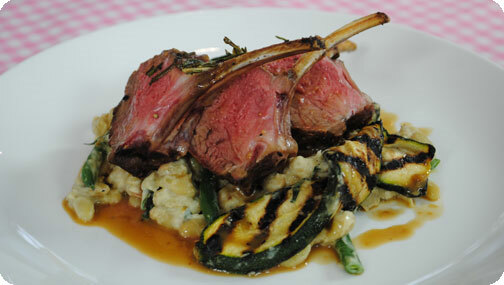 Gizzi’s Roasted Rack of Lamb with Warm Courgette, Bean and Flageolet Salad has a mere 332 calories per portion. That’s a saving of over 1100 calories, yep 1100 calories, in one meal! Phew! ‘Wow!’ she was obviously enjoying it! Gizzi asked Catia to have a think about how much fat she would expect her Portuguese Shepherd’s Pie would have in it. Catia said she wouldn’t have a clue but that she thought it would be a lot. In just one portion of Catia’s Portuguese Shepherd’s Pie there is the same amount of fat as there is in a 12 steamed chocolate puddings! A massive 66grams of fat! 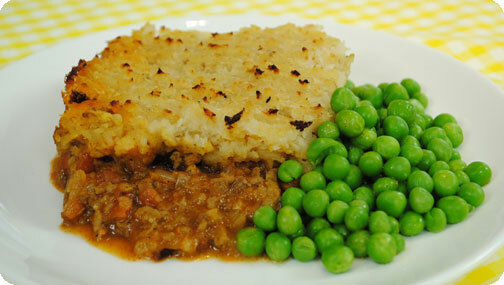 In one portion of Gizzi’s Spiced Shepherd’s Pie, there is a very modest 12grams of fat! Gizzi said that when you are cooking minced lamb, if you have a good quality non-stick frying pan, there is no need to use oil to brown the mince. Another good tip – invest in a decent pan and save on the fat! To help reduce the fat and calories even more, make sure you drain the mince – Gizzi got at least three tablespoons of fat from the mince once it had been browned. She also suggested bulking up the mince with onion, chopped carrot and leek. Tip after tip in this episode! While they waited for the sauce to simmer and thicken, Gizzi asked Catia how the dish was different so far. Catia said that Gizzi had used a lot more vegetables than she would. 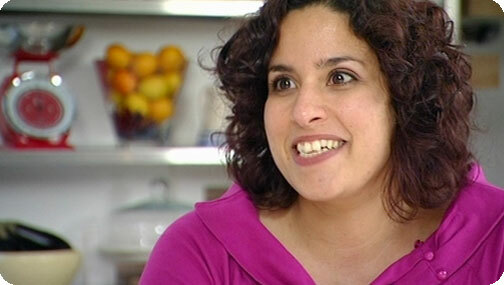 Catia said she felt great – she couldn’t believe the amount of calories she would normally eat. She said it was really good to know the new recipes that were lower calorie and lower fat. Gizzi asked if her new techniques would be useful and Catia said she would definitely use the idea of spraying the oil to cook with and that intended to get an oil pump. ‘Cos actually, I’ve got you a gift,’ and she presented Catia with her very own oil pump. Catia was over the moon and said she would definitely use it. If Catia did nothing but swap her three favourite dishes for the versions that Gizzi has shown her and continued with 20 minutes of exercise each day, she could lose 2 stone in under a year! And that is how to cook yourself thin!